Looking for a Home Appraisal in the Houston River Oaks Area? As one of the top providers of residential and commercial appraisal services in the River Oaks area, our Texas certified appraisers can help you with appraisals for both private and banking use. Our philosophy is to deliver a fast, reliable and comprehensive appraisal report that meets our clients’ needs exactly. We have some of the most competitive appraisal fees in the area and are known for delivering reports faster than the typical company. Our roster of appraisers are all local to the Houston area and are experienced in appraising for various property types, for all purposes including residential, commercial and mixed-use properties. For commercial projects we only assign Texas Certified General appraisers with a minimum of 10 years of experience in the Houston market. Additionally, our appraisers are able to perform appraisal services for any use including financing, private matters, insurance, legal issues and any other scenario that requires an concise and reliable property value. We are dedicated to providing competent, courteous and prompt services to all our customers be it homeowners or industry veterans. Should you have questions, or cannot find the precise service you need, you can use our website contact form or call us directly at the number displayed on this page. 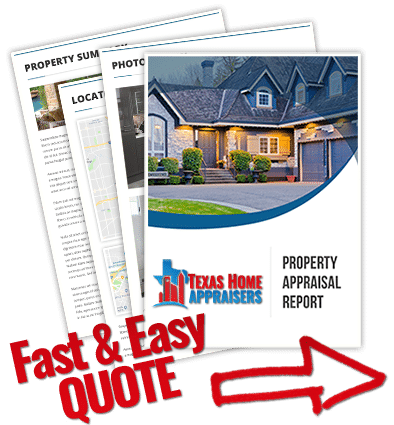 If you need a certified real estate appraiser in Houston TX to carry out a quick and friendly appraisal for your home, call the number above today or fill out the fast online quote form. Appraisers may be “handcuffed” when good comps are difficult to find. Generally the appraiser will request a variance and to be allowed to go further out in distance or further back in time for comparable sales. These are perfectly acceptable solutions to a lack of comps, and the appraisal report even includes an adjustment line for “age of sale”. An appraisal is a scientific approach to determining a likely value for a property. The process has six major steps which include: definition of the problem, preliminary survey and appraisal plan, data collection and analysis, application of the three approaches to value, reconciliations of value indications, final estimate of defined value. Common to most all appraisals is the determination of applicable approaches to value which include Market Data, Cost and Income. The three approaches are reconciled and the value via most applicable approach, in the opinion of the appraiser, is selected as the final estimate of value. In most residential appraisals, particularly those of single or two family dwellings, the direct sales comparison or market approach best reflects the actions of buyers and sellers and is the most convincing and defendable approach to value. Will the appraiser need to measure my house? Because much private, corporate, and public wealth lies in real estate, the determination of its value is essential to the economic well-being of society. It is the job of the professional appraiser to determine these values by gathering, analyzing, and applying information pertinent to a property. The appraiser’s professional opinion acts as a hedge against risky investments or purchases within current market trends. Due to the risk involved for borrowers and lenders, the appraiser’s opinion of value reduces the possibility of overpaying or over lending on the purchase of real property.